Saree originates from the Prakrit word "Sattika" . While ancient scriptures suggest the tradition of draping Women[considered to be embodiment of power and divinity] in something as exquisite and auspicious, there is another view also. According to natyashastra, the midriff is left bare while wearing a saree because the naval area is supposed to be source of life, creativity and positive energy. Hence follows the silhouette. Every Indian has seen women in their family gracefully attiring themselves in Saree. The world of wefts, folds, patterns, texture and wearing styles which is 108 to be precise is a splendid thing to know. The modern ‘urban’ style of draping the garment was first adopted and popularised by Rabindranath Tagore’s sister-in-law. 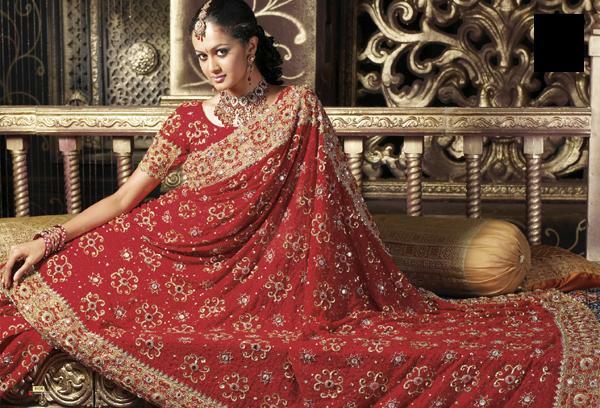 Saree has given a niche' identity to Indian fashion industry from the times immemorial. While traditionally Indian saree is worn on all formal and special occasions,the wearer finds a unique glory in wrapping up in it. Banarasi silk saree from UP-wherein real gold,silver and bronze threads are used to adorn the most exquisite floral and geometrical patterns. Shalu saree from UP also comes under this category. The brocade work is a thing to preserve from one generation to another. Kanchipuram (locally called Kanjivaram) – Tamil Nadu ,Coimbatore – Tamil Nadu,Chinnalapatti – Tamil Nadu,Chettinad – Tamil Nadu,Madurai – Tamil Nadu ,Arani – Tamil Nadu,Pochampally – Andhra Pradesh ,Venkatagiri – Andhra Pradesh,Gadwal – Andhra Pradesh,Guntur – Andhra Pradesh,Narayanpet – Andhra Pradesh,Mangalagiri – Andhra Pradesh,Balarampuram – KeralaMysore Silk – Karnataka,Ilkal saree – Karnataka . Here’s the bottom line: whether you are an everyday wearer or a special-occasion wearer, or even someone who sees the sari as a work of tactile art, It is special for all! It is something that India has given as an input to the world in terms of fashion. Where else will you find so much emotions,drama, flow, gracefulness and sophistication all entwined into one piece of garment simultaneously? "Where else will you find so much emotions,drama, flow, gracefulness and sophistication all entwined into one piece of garment simultaneously?" Agreed. It's the only outfit which makes you look traditionally modern and beautiful. Great work. Yeah. and for people like me, Saree has always been an oxymoron... Sensually decent. Hope everyone noticed 71 different kinds and styles of draping sarees yesterday @ opening ceremony of CWG?